John Fairfax AO, the Chairman of the Royal Agricultural Society Foundation (RASF) and former Director of Fairfax Media and Past Chairman of Rural Press , Australia’s largest publishers of regional and agricultural news and information has accepted the invitation to judge and attend the Animals on Bikes presentation night on Saturday 26th November 2011. Local Rural Achiever and ex-Miss Cumnock Showgirl, Rebecca Staines won $25,000 for the community’s project from RASF to help strengthen and improve the new tourist trail initiative stretching 120km from Molong to the Dubbo Zoo, via Cumnock and Yeoval. Eight show societies were offered $1,000 for materials to build an “Animal on a bike” sculpture to promote their local show and their farming community town; while 10 local schools received $500 each in order to produce a sculpture that represented their community. Many farmers are keeping their designs and masterpieces secret until judgment day, however it has been revealed that the Wellington Show society has created a ‘Horse in Wellington Boots on a bike’ and the Parke’s Show society is representing Elvis, the Dish and the Parke’s Boars team in their masterpiece. Although the Animals on Bikes project commenced in 2009, the generous $25,000 RASF grant Rebecca received will assist with the second phase of the initiative that will take the number of sculptures on permanent display from 40 to 100. This growth will promote the entire area across 6 local council areas and many small villages. The Animal on Bikes project addresses some of the varied challenges faced by small country towns including; declining population, unemployment, struggling rural businesses as a result of drought and traffic that bypasses on major highways and lack of tourist attractions to draw visitors. “We believe the number of tourists, especially caravanning couples has increased since the word has been out about the Animals on Bikes tourist drive. We have seen many tourists come through our doors especially on weekends which has helped to increase trade for us in what has been a relatively tough time for local businesses in general” (Gail Curtis , Gift & Homeware House Yeoval). “The morale of the farming families involved in the project has visibly lifted. It seemed to strengthen the community spirit of all of the towns involved” (Amanda Murdoch, “Tindoo”, Molong). The judging and presentation night for “Animals on Bikes” sculpture competition is Saturday 26th November 6-9pm at the Cumnock Crossroads building with a wine tasting and photographic exhibition of all new sculptures. ONE MONTH TO GO before entries due! With school holidays almost finished, locals are preparing for the next 'Animals on Bikes' sculpture competition! Have you started yours? or still thinking about it? We knew about this 2 years ago and yet we leave it until the last minute! Human nature?? Dubbo Show society have done a 'red back spider on a bike' while Wellington show have done a 'horse in wellington boots on a bike'! There are 6 more show societies to reveal their masterpieces and the local schools will complete finishing touches over the next few weeks! If you have a paddock please let us know, as we are aiming for another 40 sculptures to appear along Obley rd by the end of the year. Remember to keep Saturday 26th November 6-9pm FREE as that is the next presentation night of the winners at Cumnock Crossroads building. We distributed 2,500 flyers this week to get some more locals fired up about our paddock art sculpture competition. Great to see Murray's bridge finally finished, I am sure the extra tourist traffic along this road has contributed to this early completion! Prime TV News, The Land and Central Western Daily have all been preparing articles this week! Discover magazine, Dubbo Liberal and Wellington Times will feature us next month. We look forward to your large creation and feedback on our next sculpture competition. Announcing $10,000 prize money for the next “Animals on Bikes” paddock art sculpture competition. “We have recently upgraded to a new coffee machine and new coffee grinder with Bill’s Beans to cater for the increased business from caravaners and tourists stopping for a cuppa along their trip down the sculpture trail”. Cabonne Council has noticed an increase in traffic and improved roadwork and bridgework is being undertaken. Organisers are anticipating another 40 sculptures to be erected, aiming to take total to 100 “Animals on Bikes” sculptures by 2012. The Royal Agricultural Society of NSW has been an enormous help with providing assistance to help fund 10 schools and 8 show societies to enter a masterpiece that represents their town and area. A People's Choice Award will also be presented on the night. 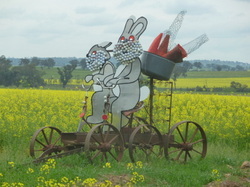 The first entry has been received by Laurelle Neville, Les and Elaine Hunter from Yeoval called “The Rabbits” (pictured below) which is made up of a Feed bin, Sheet iron, witches hats, old rusty bed, trolley on wheels, plough seat group, bikes and golf balls and placed halfway between Cumnock and Yeoval. Another pig on a bike has appeared next to the Cumnock Police station since the last competition, although no official entry received yet! “Most sculptures have been constructed from old farm yard scraps and recycled materials from backyards and tips, and that is what makes them so quirky and appealing to passing ttravellers” said Christine Weston one of the organisers.